The Black Country had an extensive network of tramways, which were run by four companies all owned by the BET (The British Electric Traction Company Ltd). 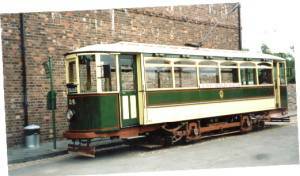 Due to the very poor state of the track after the First World War, double deck trams were forbidden by the Board of Trade and several single deck trams (the Tividale Cars) were hurriedly built locally to replace them. 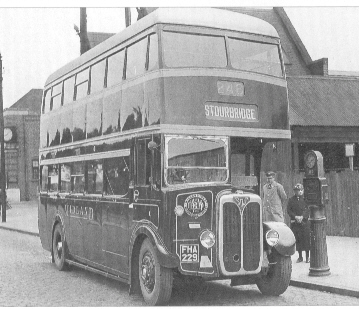 By 1931, nearly the whole network had closed and operation of the replacement buses in Dudley, Stourbridge and surrounding areas had mainly transferred to a fifth BET company - The Birmingham and Midland Motor Omnibus Company Ltd or BMMO, which had been operating since 1904. Around this time, the BET was wound up due to a national decline in tramway operation. Wolverhampton had converted the lines in Bilston going onto Dudley to trolleybus operation and the remaining 3 routes passed over to Birmingham, who continued tramway operation until 1939. These were the two lines from Dudley to Birmingham (the 74 and 87 - still operated by Travel WM) and the 75 from Wednesbury to Birmingham (renumbered 79 and extended to Wolverhampton by WMPTE). In the early BET days, the BMMO vehicles were painted red with the BET magnet and wheel logo, which was replaced with the word MIDLAND in gold lettering, thus resulting in the nickname Midland Red (though legend has it that that was the official name for the colour of the buses). This was said to be achieved by painting the buses brown first, then applying the final red coats giving the distinctive rich deep red colour that was such a familiar sight in most midland towns and cities. However, this seems unlikely as restored vehicles are simply painted the normal way and are still the same distinctive colour. But it makes for a good tale. The network was huge, stretching from Hereford to Ludlow, Shrewsbury, Stafford, Burton on Trent, Leicester, Northampton, Banbury, Evesham, Tewkesbury, and Ross on Wye. The full history of the BMMO is far too involved for this page, which only gives a very brief history of its 40 odd year reign in the Black Country. What really stood out though, was the fleet itself. By 1930, all the vehicles were being built by BMMO themselves. This continued until the late 1960s when Daimler Fleetlines (but still with distinctive BMMO styling) were purchased. The most famous model was the D9 , which cunningly set the front wheels slightly back giving a long, but highly manoeuvrable vehicle. With its enclosed rear platform and stylish interior it was the height of luxury at the time. I well remember catching the 882 from Penn into Wolverhampton as a treat - the extra comfort being well worth the extra few (old) pence it cost. The D9 was the midlands equivalent of the Routemaster, but, in my opinion, far superior (having actually driven both). 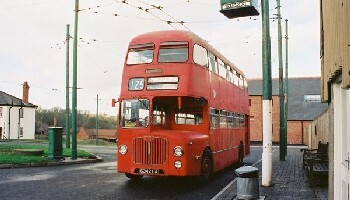 A mixture of double and single deck buses were used in the Black Country. The routes that strayed into Wolverhampton were mainly double deckers, but on the routes round the hilly areas, the single deckers were the more familiar sight. Operation in Dudley survived the introduction of WMPTE, but only by 4 years. By then, BMMO (renamed "Midland Red" after 1974) was part of the NBC and the lovely deep red livery was being replaced by the insipid NBC red and cream. In 1973, WMPTE effectively became part of West Midlands County Council and took over Coventry's fleet and Midland Red's operation in Dudley. In return Midland Red took over the country bus services of Wolverhampton and Walsall. Ironically, some of the Wolverhampton routes were ex-BMMO routes taken over by the corporation in 1928. D7s, D9s and S20s (and S23s) continued to be a familiar sight in Dudley, but painted in WMPTE royal blue and cream. One former WMPTE D9 (5432) survives at the Black Country Living Museum. During the next few years WMPTE standardised its fleet and the last reminders of Midland Red in the Black Country disappeared. The company itself disappeared in 1981, split into 5 separate companies. Background is the BMMO logo as printed on official publications.